Domingo Barrios, CEO/President of Heifer International Foundation recently visited Sacramento and invited area Heifer volunteers to meet with him. 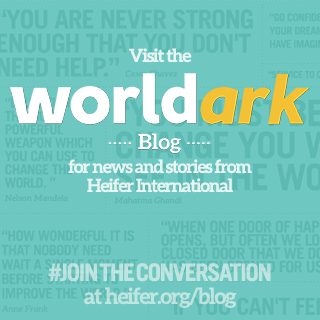 In his position since July 2010, Mr. Barrios came to Heifer with extensive experience in the non-profit sector. The mission of Heifer International Foundation (HIF) is to work with donors to support Heifer International through legacy gifts. HIF currently manages an endowment valued at $70 million and supports Heifer International at the rate of 5 1/2 percent annually. Mr. Barrios reported that he would like to see the endowment grow to $250 million by the year 2014. As part of this plan, he envisions each of the individual country program endowments managed by the Foundation growing to $1 million. Mr. Barrios expressed his desire to have a blended marketing approach between Heifer International and the Foundation. He favors named "endowment campaigns" and more visibility for the Foundation through broadening the Dan West Award program to make it a means of funding a Dan West Education Endowment. "Volunteers are the key to our work in the U.S.," Mr. Barrios told the local group. Since 85 % of Heifer revenue comes from the Gift Catalogue, there is a real opportunity to make direct contact with donors on behalf of the Foundation through an expanded use of regional volunteers. Our enthusiastic group of volunteers suggested to Mr. Barrios their willingness to enhance the visibility of Heifer Foundation at promotional events. Hopefully, we will be able to do this through continuing our education about HIF and having access to appropriate tools to share with the interested public.